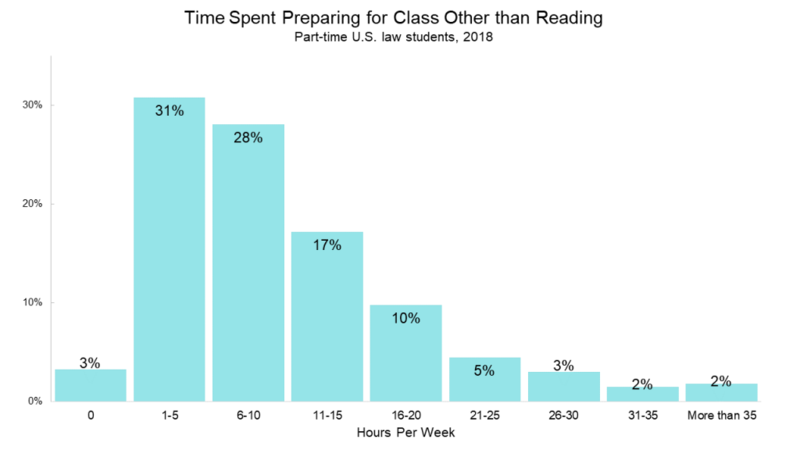 In our previous post, we shared some general trends about how much time law students spend preparing for class each week. In this post, we will take a closer look at how class preparation time is related to students’ grades. 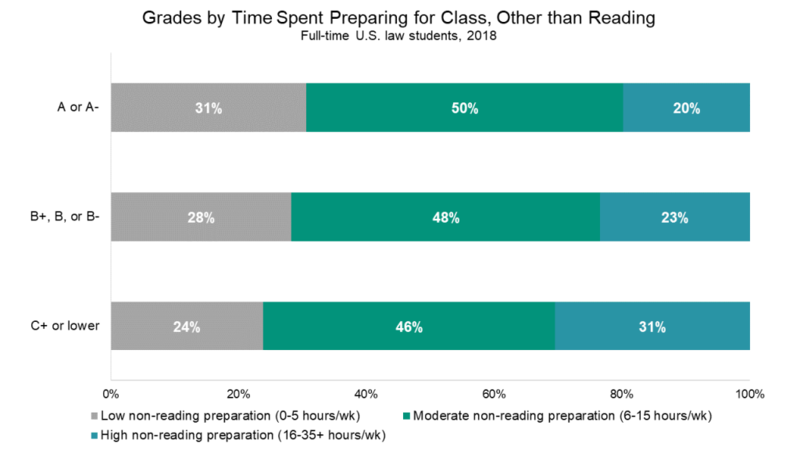 The hour ranges are different for reading and non-reading preparation because they were chosen to encompass roughly 50% of the law student population in the moderate range and 25% of the law student population in each of the extremes. Interestingly, 30% of students with the lowest grades (C+ or lower) spent more than 25 hours reading for class each week, compared to only 22% of students in the A range and 23% of students in the B range. Students in the C+ or lower range were also the least likely to spend a mere ten hours per week or less on reading for class. This same pattern is even more pronounced for non-reading preparation. 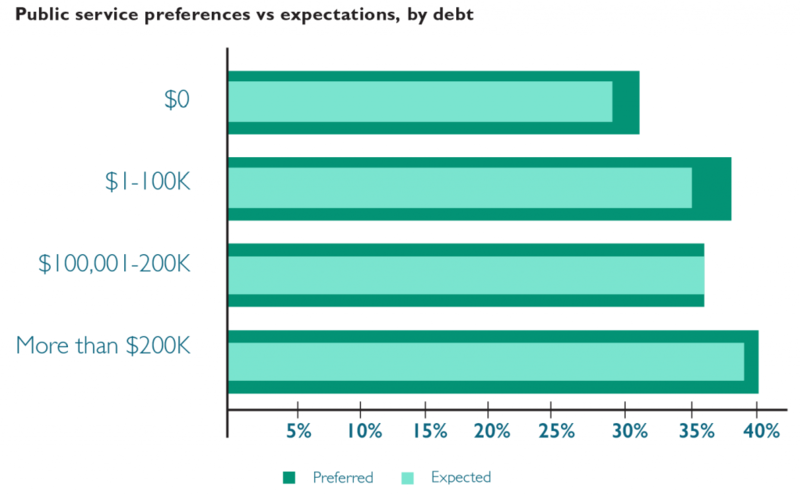 Thirty-one percent of students in the C+ or lower grade range report spending 16 hours or more per week on non-reading class preparation, compared to only twenty percent of students who received mostly A grades. 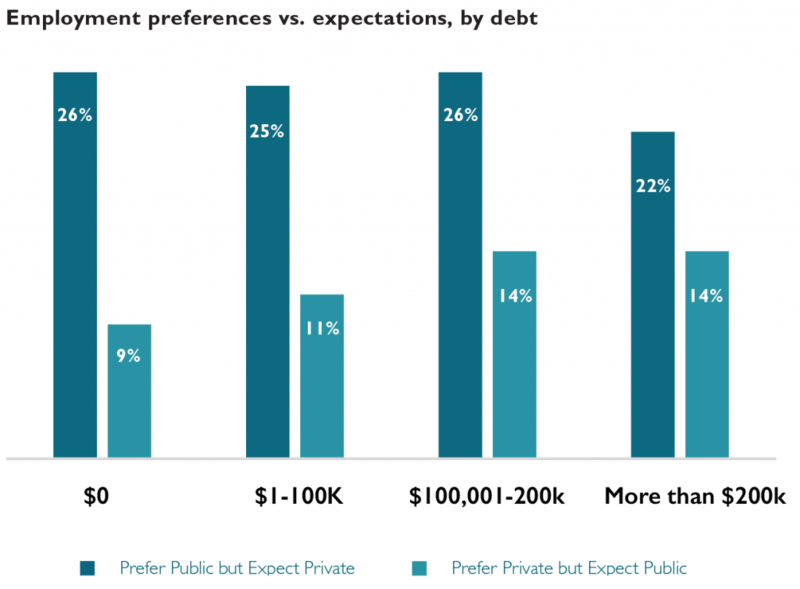 The highest-achieving students are also the most likely to report spending 0-5 hours per week on non-reading class preparation (31%), and the students with the lowest grades are the least likely to report spending that little time (24%). Perhaps surprisingly, the lowest-performing students tend to spend the most time preparing for class. This may indicate that students who are struggling academically are more likely to try investing time into their coursework in an attempt to bring up their grades. Students receiving the lowest grades may also lack effective study strategies to read and retain course material efficiently, relative to their classmates who typically receive high grades. The popular image of the law school experience is one of intense classroom environments and even more intense reading loads. 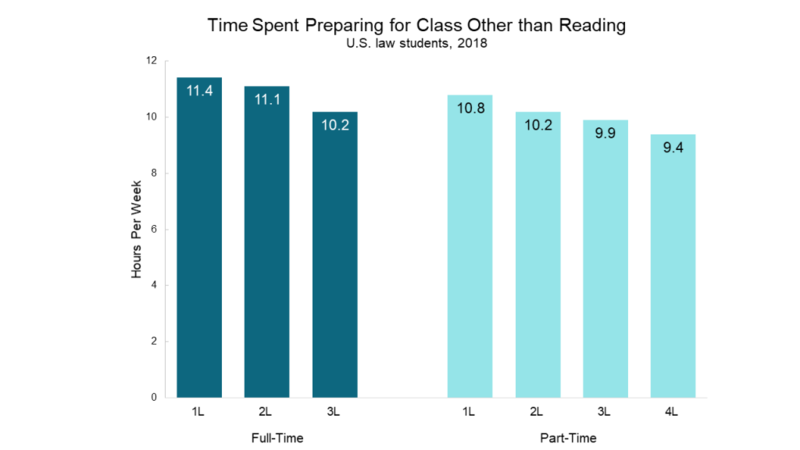 So how much time do law students actually spend buried in the books? 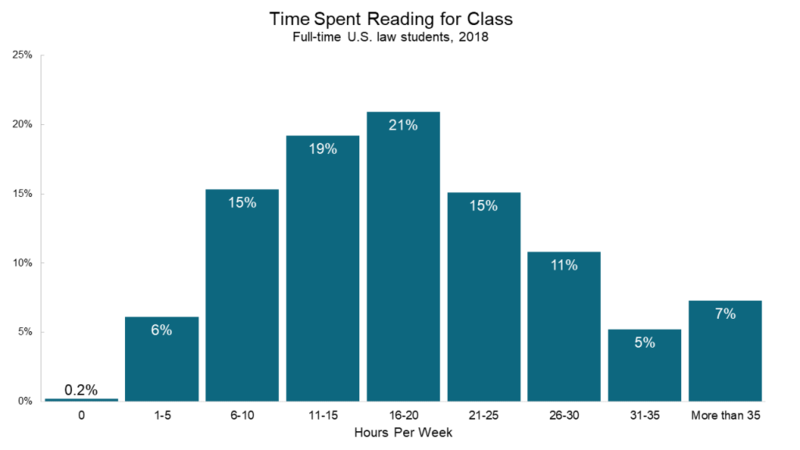 According to LSSSE data, the average full-time U.S. law student spent 18.6 hours per week reading for class during the 2017-2018 school year. Part-time students tended to spend slightly less time reading per week compared full-time students, presumably because of their lighter course load. 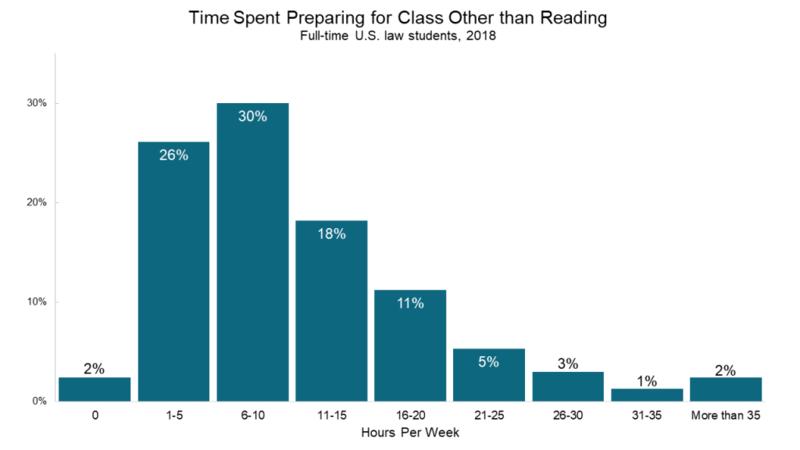 This translated to 15.7 hours spent reading each week for the average part-time U.S. law student. 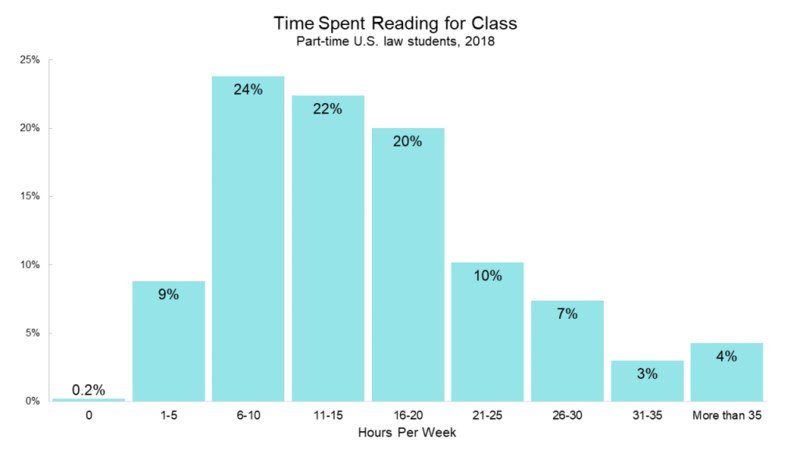 Perhaps not surprisingly, newer law students tend to devote more time to reading for class than their more seasoned law school colleagues. 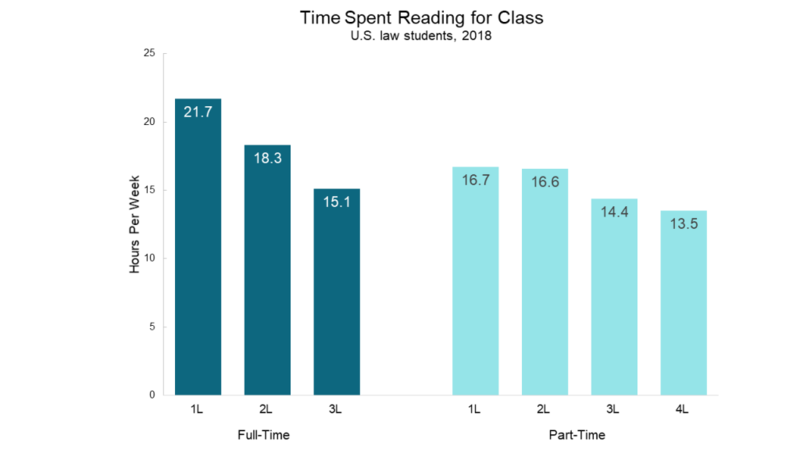 In 2018, full-time 1L students read for 21.7 hours per week while full-time 3L students read for approximately 15.1 hours. 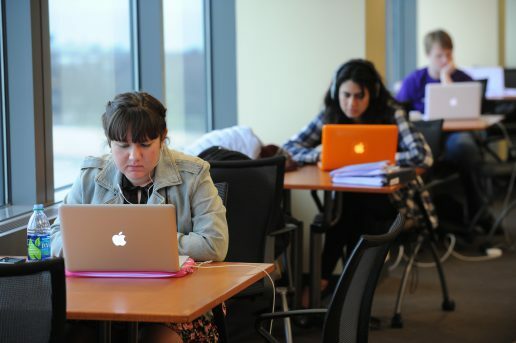 Full-time 2L students fell right in between with an average of 18.3 hours per week. 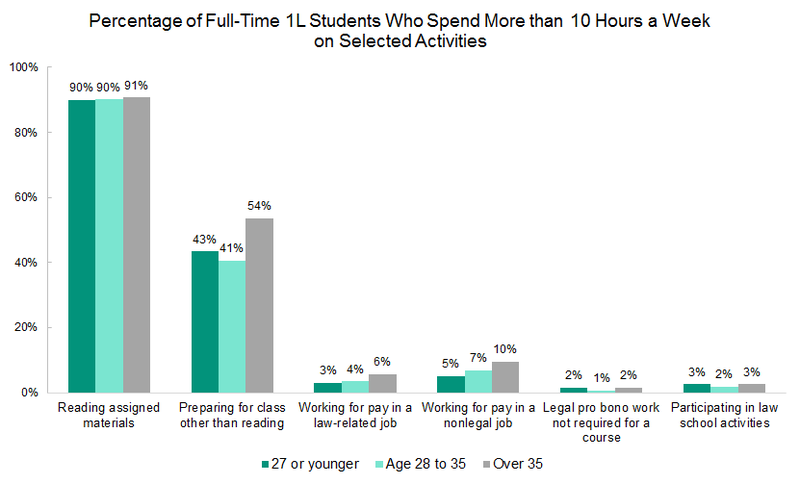 Part-time students follow a similar pattern, except with a smaller drop-off across years. Certainly there are other ways to prepare for class besides reading. 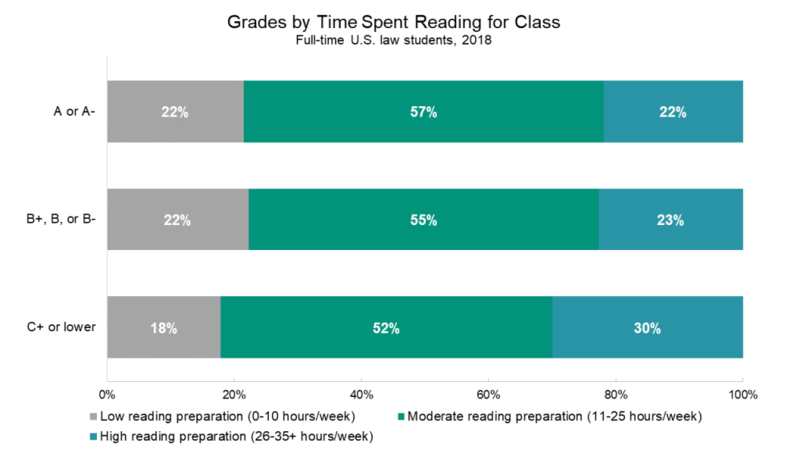 LSSSE also asks how much time students spend each week on non-reading class preparation, which includes activities such as trial preparation, studying, writing, and doing homework. 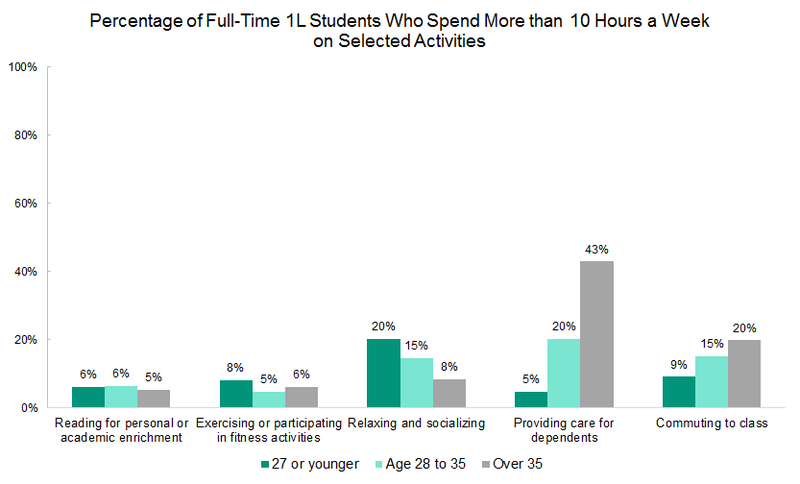 Interestingly, full-time students and part-time students spend approximately the same amount of time on non-reading activities, with full-time students logging around 11.0 hours per week compared to part-time students’ 10.2 hours. The pattern for time spent on non-reading class preparation activities across class years looks similar to the pattern of reading preparation activities, with the number of hours per week decreasing for students in later stages of the program for both full-time and part-time students. How does this preparation for class intersect with students’ experiences in the classroom? 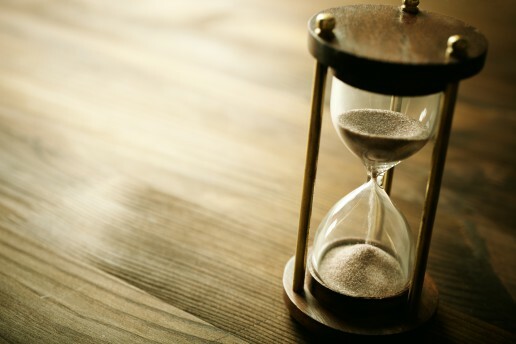 In our next blog post, we will share some surprising findings about how the amount of time spent preparing for class is related to both grades and to students’ perceptions of how effectively instructors use class time. 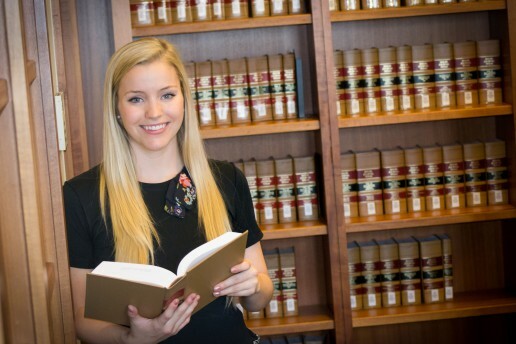 The Law School Survey of Student Engagement (LSSSE) provides a treasure trove of information about the law school experience from the perspective of law students themselves. 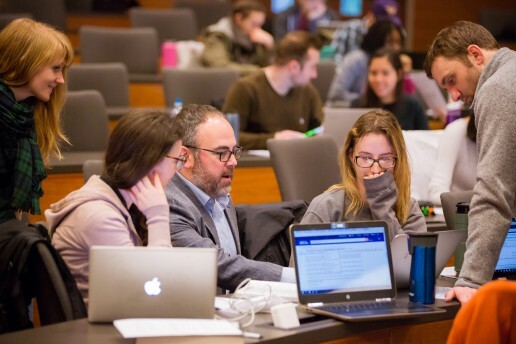 LSSSE partners with legal education scholars to provide access to de-identified data about topics ranging from student satisfaction to time usage to personal and professional development. Many researchers – particularly those interested in questions of diversity and equity – are interested in how closely the students surveyed by LSSSE reflect the gender and racial/ethnic composition of the entire law school population. 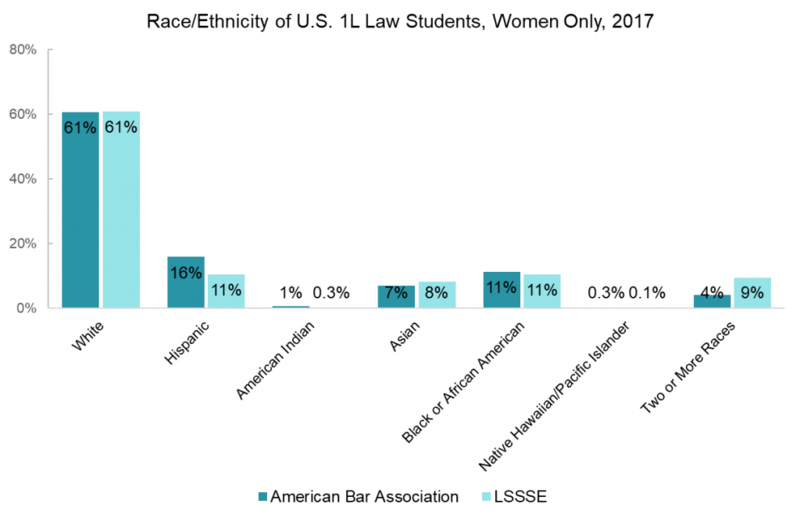 To answer this question, we compared the self-reported gender and race of 2017 U.S. 1L LSSSE respondents to the 2017 matriculant gender and race/ethnicity aggregate data available from the American Bar Association (ABA). 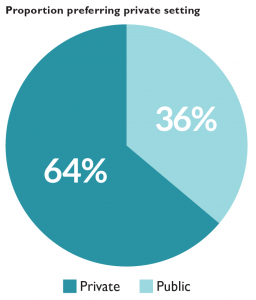 The ABA reported that slightly more women than men enroll in law school (52% vs. 48%). 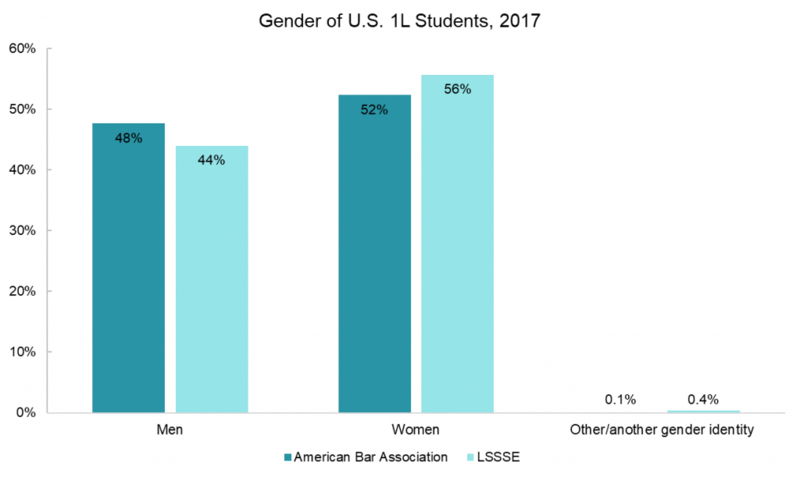 U.S. 1L LSSSE respondents in 2017 were similarly more likely to be female than male (56% vs. 44%). 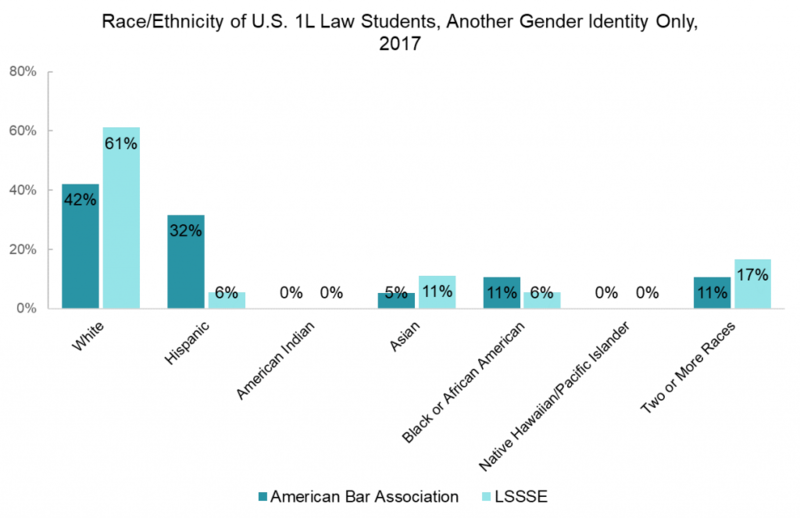 Although both the ABA and LSSSE collected data students identifying as “Other” (ABA) and “Another gender identity” (LSSSE), these individuals make up only a tiny fraction of the law student population (24 people according to the ABA and 22 people who responded to LSSSE). 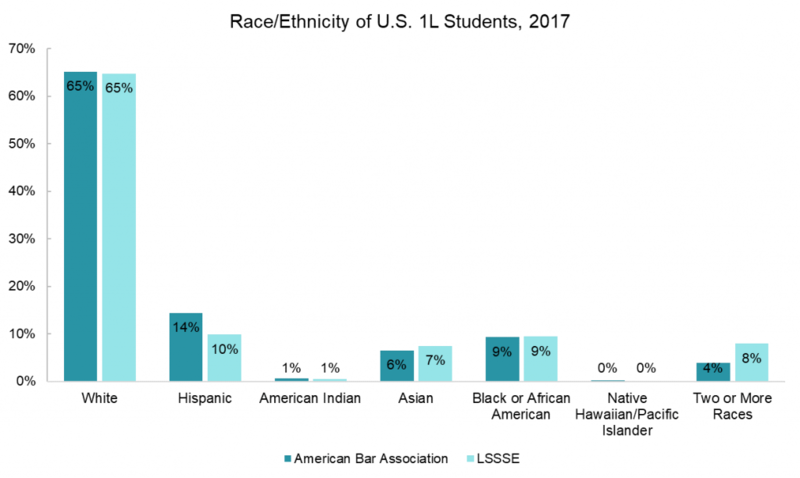 The 1L students who responded to LSSSE in 2017 were also quite similar to the overall population of 1L students at all ABA-accredited programs in terms of racial/ethnic makeup. Sixty-five percent of both groups were white, nine percent were black or African-American, and around six percent were Asian or Asian-American. The ABA reported a slightly higher proportion of Hispanic students (14%) compared to the proportion of Hispanic LSSSE respondents (10%), and LSSSE respondents were more likely than the population of 1L students at ABA-accredited law schools to be multiracial (8% vs. 4%). However, the overall pattern of race/ethnicity frequency is quite similar among the two populations. Thus, LSSSE respondents tend to represent the demographic characteristics of law students in general. The ABA and LSSSE datasets also allow us to examine the intersection of gender and race/ethnicity among 1L students. 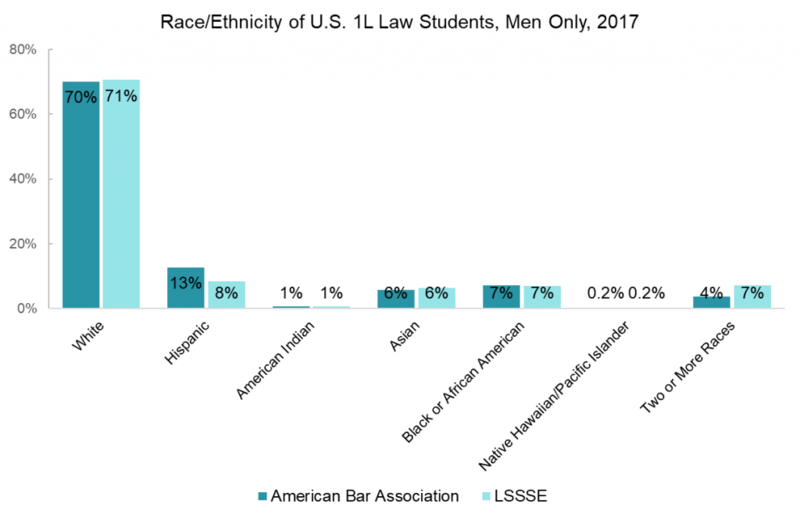 Interestingly, a higher proportion of male law students than female students are white (70% vs. 61%). The general trends regarding the proportions of students from different racial and ethnic groups described across all students hold true for men and women when examined separately, but the same cannot be said for students of other gender identities, likely because this group is so small. 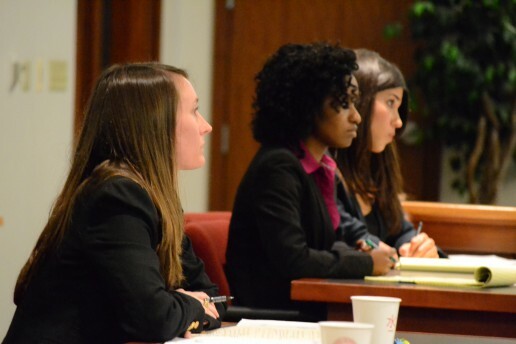 In the aggregate, LSSSE offers a representative sample of law students in terms of both race/ethnicity and gender identity, making it a great source of information about student engagement and the law school experience. Check out some of the publications using LSSSE research or contact us to discuss how a LSSSE data-sharing agreement might enhance your legal education research project. 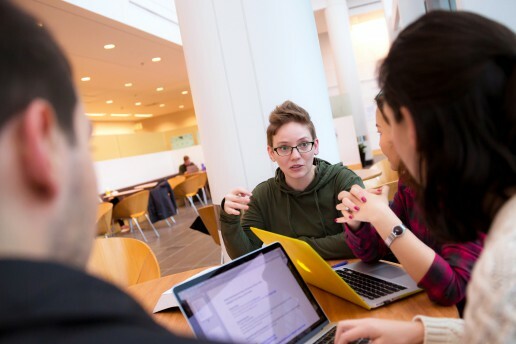 The Law Student Survey of Student Engagement (LSSSE) asks students about the quality of their relationships and interactions with law school faculty as a way of measuring whether students feel valued by others and engaged with the law school experience. 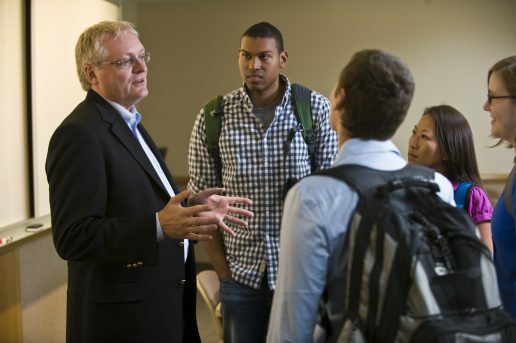 As a group, law students tend to have positive perceptions of their instructors. 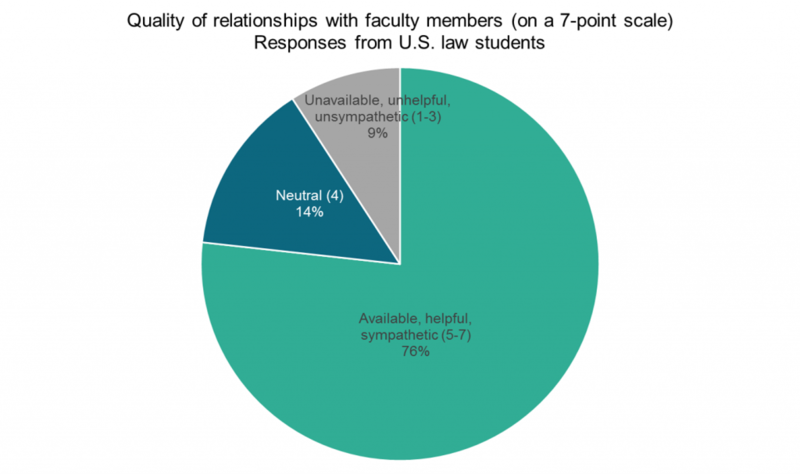 In 2018, 76% of the 17,928 U.S. law students who responded to LSSSE rated their relationships with faculty as at least a “five” on a seven-point scale, where “one” was the perception of faculty as “unavailable, unhelpful, and unsympathetic” and “seven” was the perception of faculty as “available, helpful, and sympathetic.” Male and female students were pleased with their instructors at equal rates, although students of other gender identities were somewhat less satisfied, with only 61% rating their relationships with faculty a “five” or higher. 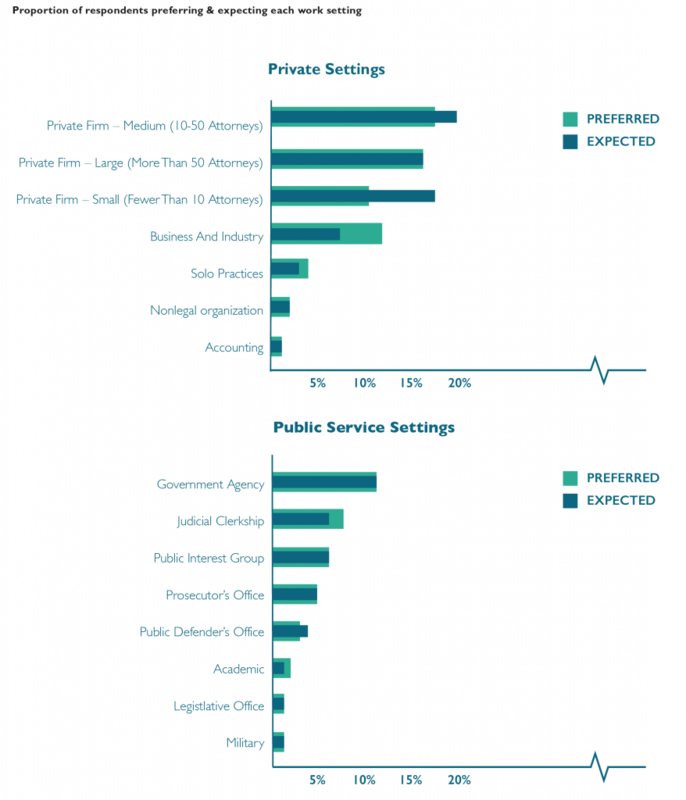 In 2018, a subset of 7,718 LSSSE respondents received the popular Learning Experiences and Professionalism (LEAP) module, which dives more deeply into students’ perceptions of both the law school community and their own readiness for legal practice. The vast majority of law school students (93%) agree or strongly agree that their instructors “care about my learning and success in law school.” Students in their first year of law school are most likely to strongly agree with this statement (44%), but overall there is not an appreciable drop in students’ sense that their instructors care about their law school experience across class years. Only 6-9% of students in any year of law school disagree or strongly disagree that their instructors care about them. The LEAP module also asks whether student believe that their “instructors demonstrate sensitivity to diverse backgrounds and perspectives in their interactions with students." Among U.S. law students surveyed in 2018, 89% of students agree or strongly agree with this statement. There is some variation among students of different racial groups: 92% of white students agree or strongly agree that their instructors are sensitive to issues of diversity while only 67% of American Indian or Native American students share this viewpoint. This suggests that disparities still exist, particularly in how students of color perceive faculty attitudes toward diversity and how students from varying backgrounds are treated in the classroom. 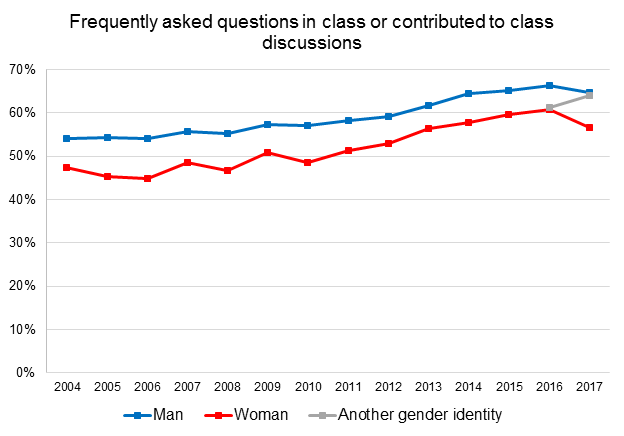 Combining the students who participate “often” and “very often,” we see that this gender gap has existed every year that LSSSE was administered, going back to the inaugural survey in 2004. 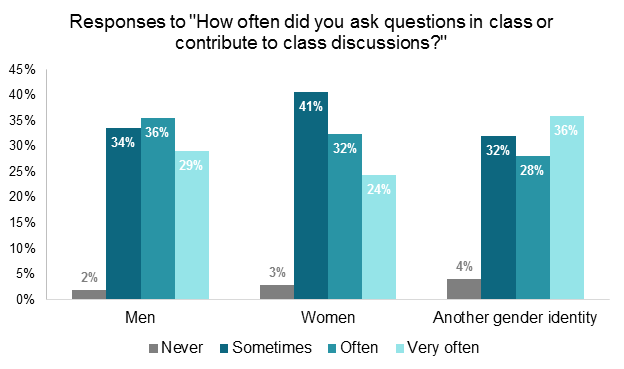 Interestingly, although the overall percentage of respondents who frequently participate in class has fluctuated over the years, the gap between male and female participation has stayed fairly constant. 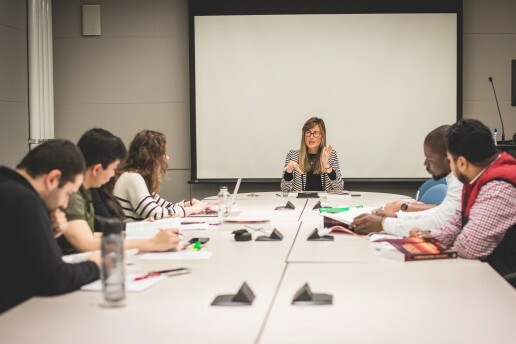 LSSSE added a third gender option in 2016, which means that future data sets will give us a more nuanced understanding of the law school experience for students of all genders. 1 Independent samples t-test, t=10.0, p<0.001, d=0.2.